Daughter of Fortune is great material for a telenovela. It's a story that spans the life of Eliza Sommers who grew up in Valparaiso, Chile not knowing who her real parents are. She was brought up to be a lady fit to be wed to a man of good stock and good money. But it was not to be her fortune. Allende did a fine job in painting a picture of 19th century Valparaiso: the sights, the sounds, the smells. Even the social climate. No surprise there. What was even more captivating was her illustration of the same: sights, sounds, smell, and sociology, but this time of two other cultures: Chinese and the California Gold Rush. I couldn't help but feel as if I were reading a history book. The difference is that this one was actually a joy to read. I envy Eliza, not because she experienced a great love; I envy the many adventures she found herself having throughout the years that she was following the ghost of that love. She is fortunate in some ways, but you've got to give her credit for surviving those years too. Yes, she was a stupid teenage girl who ran away from home. She was insane to have gone on that boat. But after the ordeal in the darkness of the ship's hold, she emerged as a budding woman - ready to take on the rest of the world. It is ironic that it was while she was pretending to be a boy that she showed her many strengths as a woman. 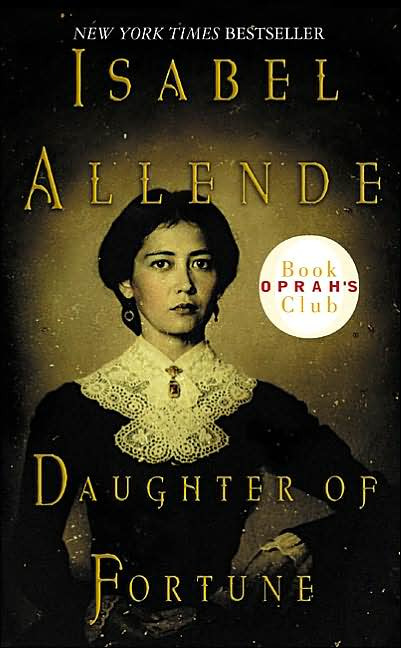 On the other hand, I was empathizing with Miss Rose while all that was happening and I felt her world collapse around her even before I read Allende's words describing how changed she was due to Eliza's disappearance. I also never suspected that there was a deeper secret than that of Rose's one true love. The times when Eliza was wondering that Miss Rose wouldn't approve of her conditions in California, I disagreed. She may not have grown up to be a traditional English lady, but she was exactly like Miss Rose: strong willed, passionate, a lady ahead of her time.